Home » Blog » Keep Your Cover Free from Debris! Winter is officially here!! Your pool is now closed, and the pool cover is securely in place. Most people tend to forget about the pool until all the snow has melted and spring has sprung. However, you need to ensure that your pool cover is intact and doing its job as there are many things out there that can wreak havoc on it during the winter. Trees branches, animals, and heavy snow loads can be devastating to your pool cover. All of these things can impale the cover, leading to rips and tears. 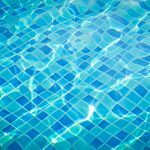 Those rips and tears allow debris to enter your pool, which can lead to algae growth and surface staining. It also presents dangers to those that may come in contact with your cover as the safety integrity can be compromised. So, who exactly is coming in contact with your pool cover when it is closed? There are a multitude of animals that show up in your yard such as deer, bear, geese, raccoons, and maybe reindeer! Those animals can easily walk across your cover causing tears and holes. If there are existing tears and holes from other sources like tree branches, these animals may be able to fall into the pool through those areas. And don’t forget your pets! Their claws can also rip pool covers as well. If your following us on Facebook, you may have seen several posts on cars, trucks, and buses ending up in pools. 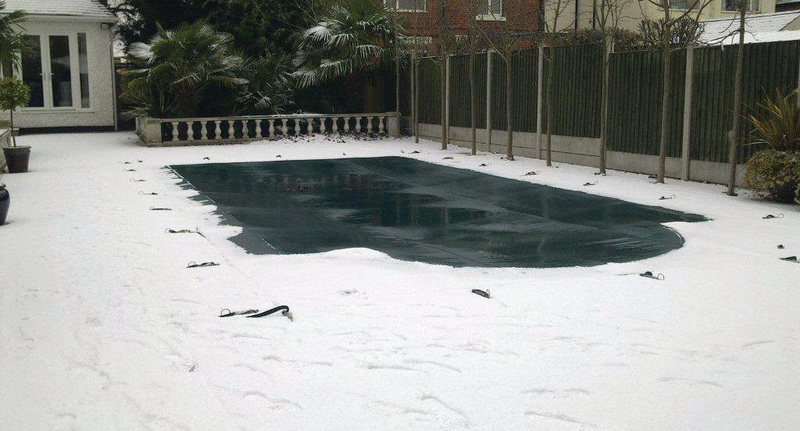 We certainly hope that your pool cover is not on that path! Other items such as bikes, motorized toys, and even skateboards, can do some damage. These are common holiday gifts that may bring smiles to your kid’s faces, but can be detrimental to your pool cover. Lawn tools and golf clubs are other gifts one might receive that can cause damage if they should come in contact with your pool cover. Weather can have the upper hand when it comes to pool covers. Heavy winds, like those from Nor’easters, make things become airborne which can land on and damage your pool cover. Heavy rain can lead to pooling water which can loosen the springs. When that happens, your cover can start to sag and your seams can weaken. If you have a cover pump, the cover can become so low and actually pump out your entire pool! Also, don’t forget snow and ice. You want to remove snow and ice, as it can also affect the integrity of the cover. It could raise your water levels making it possible for the pool pump to pump out your pool. Do not try to shovel or scrape the snow off with shovels or ice scrapers as they can damage the cover. A soft bristle broom would be the best option. So, this winter season show your pool and pool cover some love. Don’t leave it without any attention until spring, or you may be in for a sad surprise. If you need help, you can always give us a call. Until then stay warm and dry, and have a great holiday season!